Eagles Nest Outfitters provides high-quality, outdoor gear from hammocks and chairs to bug spray and rain tarps. The ENO DoubleNest Hammock is a lightweight, triple-stitched parachute-style hammock that fits two people comfortably. It's also made with a soft, breathable, and fast-drying fabric that stores easily in the attached compression sack. After a week of staring at screens in the office, the first thing I want to do every weekend is get outside and breathe in some fresh air. Finding a pocket of clean oxygen is admittedly challenging in New York City, but there are small zones throughout the city where you can achieve this level of relaxation. When I do find a nice spot to chill, laying on a blanket with a book usually gives me back pain and most chairs are either too uncomfortable to sit in or not portable enough for day-trip adventures. A hammock seemed to be the perfect solution, but knot-based portable hammocks can hurt the trunks of the trees on which they are hung. What's the point of lounging outside if that relaxation is inherently damaging to your natural surroundings? Enter Eagles Nest Outfitters, a 20-year-old brand dedicated to preserving the relationship between people and nature. It plants two trees for every hammock sold, and solved my problem with its life-changing (to me, anyway) DoubleNest hammock ($69.95 on REI) and Atlas Hammock Suspension System ($29.95). 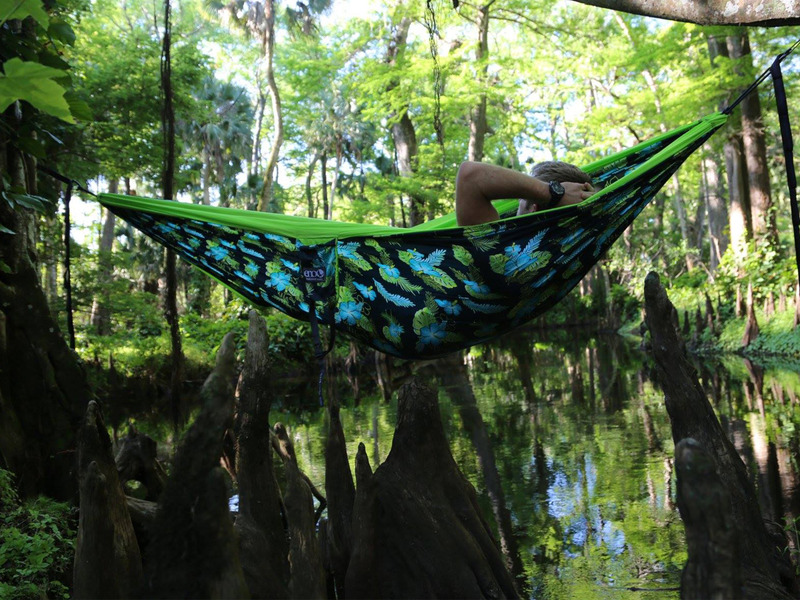 The hammock can hold up to 400 lbs., but weighs only 19 oz. and can be easily stuffed into the carrying compression bag that is attached directly to the underside. When it's rolled into the bag, it's about the size of a grapefruit, so it's very compact. ENO says its DoubleNest hammock is "big enough for two and palatial for one," serving as the perfect accessory for a day out with friends or some therapeutic alone time. As someone who is just over six feet tall, I can confirm that there was more than enough room for me and my 5-foot-5 girlfriend to lay comfortably. Eagles Nest Outfitters/FacebookI can confirm that it fits two people comfortably. I'm a little over six feet tall and my girlfriend is 5-foot-5, and we didn't feel cramped in the hammock. Last summer, I was lucky enough to stay in a cottage owned by my girlfriend's family in our home state of Michigan, and the highlight of the weekend was definitely the two of us laying in the double hammock. The cooling lake winds gently rocked us back and forth as we watched the sun drop itself into the wavy horizon. Once the gnats darting around our faces pestered us too much and the lake air turned frigid, we quickly and easily dismounted from the hammock, unwrapped the suspension system from the trees, and rolled up everything neatly into the compression bag. While the actual straps that suspend the bed need to be purchased separately for an additional $29.95, the setup and takedown took less than 10 minutes total. Besides being super comfortable, transportable, and easy to set up, ENO hammocks are really secure for any environment. All you need are two trees spaced 10 to 14 feet apart to swing the straps around and you can hop in relaxed, knowing that there is no risk of hurting yourself or your surroundings. For less than $100, you and a friend can lounge comfortably on camping trips, music festivals, or just a nice day in the park with this effortless, nomad-friendly, and no-knots-needed hammock setup. I got a free, last-minute ticket to Coachella and it's still going to cost $2,000 to go. Here's exactly what I'm spending for a weekend at the notoriously expensive festival. 4I got a free, last-minute ticket to Coachella and it's still going to cost $2,000 to go. Here's exactly what I'm spending for a weekend at the notoriously expensive festival.